January is a great month for citrus fruit. Try swapping the oranges used in this lovely lunch for this season’s blush oranges or pink grapefruit. 1. Toss together the noodles, prawns, orange segments, watercress and red onion. 2. 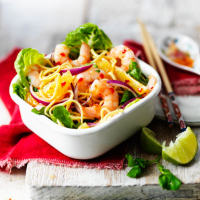 Mix together the sweet chilli sauce and lime juice, pour over the noodle salad and toss well. Chill until ready to serve. 3. Lay out the lettuce leaves and top with the noodle salad in individual bowls or on a large platter.